Although Leslie and Jinson had a more traditional Chinese wedding reception with their families, they wanted to keep their wedding day just the two of them. 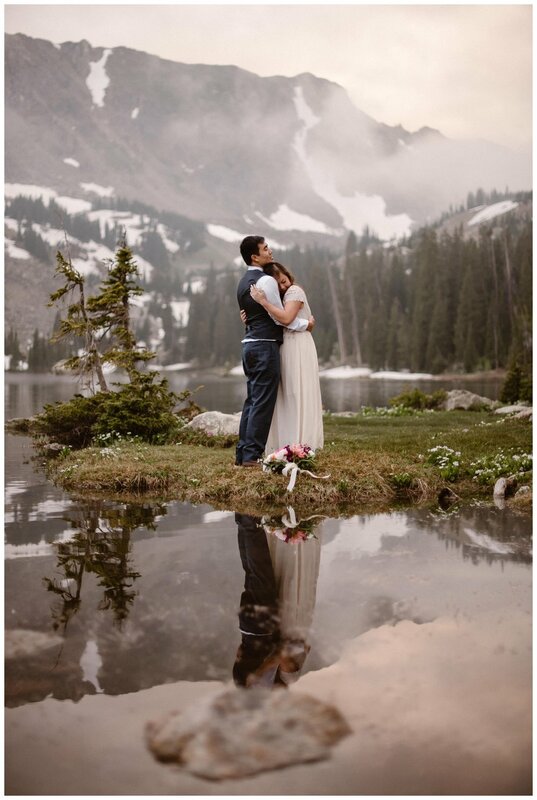 They were drawn to the intimacy of an elopement and love adventuring together so a high alpine lake elopement seemed like the perfect fit. 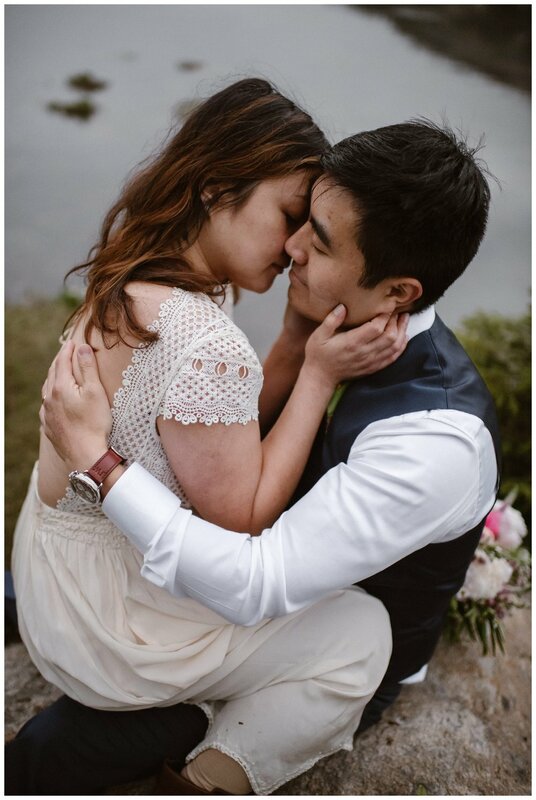 Leslie and Jinson met in high school, even going to prom together, and were friends for ten years before they started dating five years ago. It was clear from their beautifully emotional ceremony that these two are a perfect fit for each other as well. 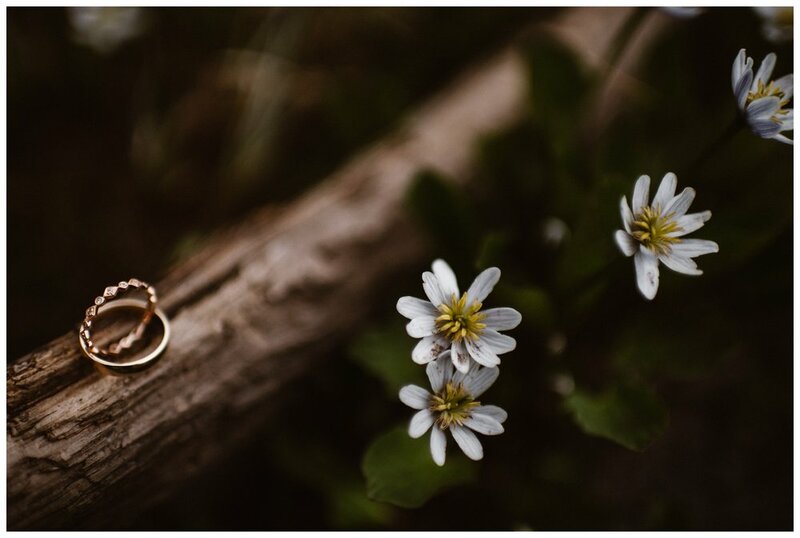 With outdoor elopements, the uncontrollable weather often presents a challenge. 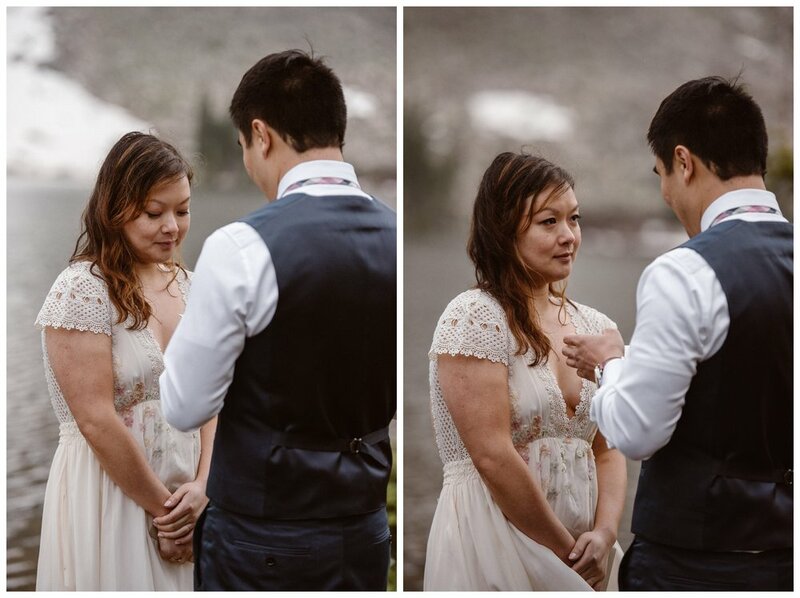 All week long, the weather was looking iffy for Leslie and Jinson’s elopement. A few days out, I even suggested changing their timeline for the morning since the weather looked a lot better early on than in the evening. Not ones to be intimidated, Leslie and Jinson decided they were up for adventure and decided to chance a hike up that day. As we started up the 6 mile hike towards a high alpine lake near Boulder, CO. Along the way, the wildflowers were in full bloom! We were treated to huge bunches of columbines, indian paintbrush and alpine bells. The forecast must have scared everyone else away from this popular hiking trail because we were totally alone for most of the hike, seeing only a few people hiking down as we went up. 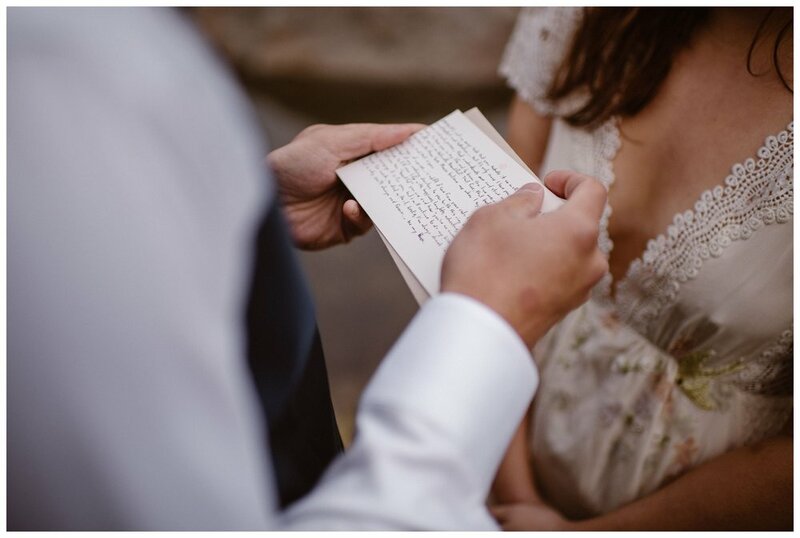 It was incredibly secluded and private as Leslie, Jinson and I arrived where they were going to say their vows. 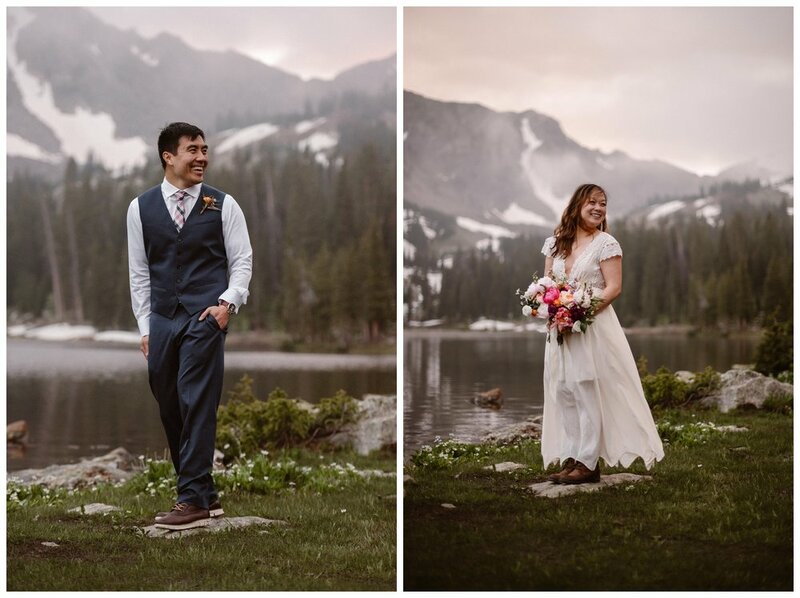 Leslie and Jinson’s risk paid off and, as we arrived, the clouds were just kissing the mountain tops surrounding the lake. We were treated to amazing and dramatic weather as the clouds danced around the peaks, with the light playing tricks on the mountain. 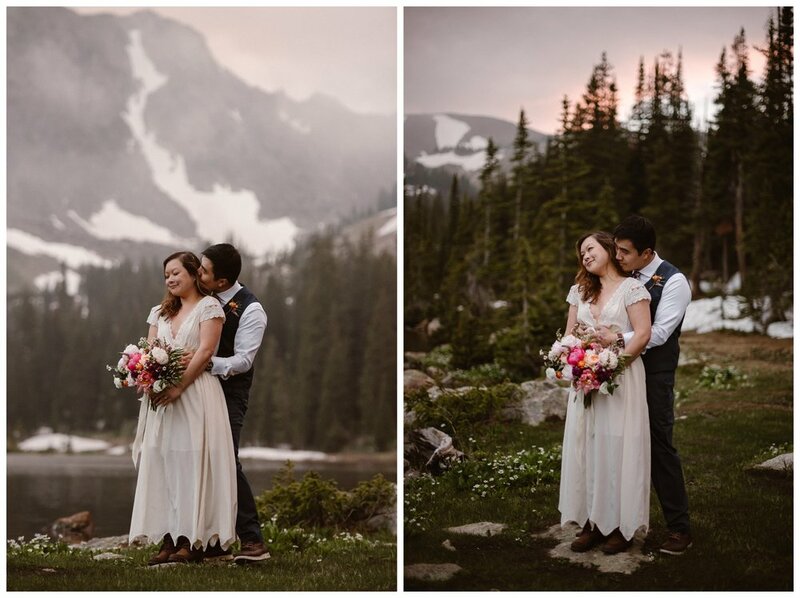 It was a striking pink sunset, with the moody clouds over the lake as they committed their lives to each other on the shores of the high alpine lake. I was privileged to be their only witness and sign their marriage license. Doing this for couples absolutely never gets old. 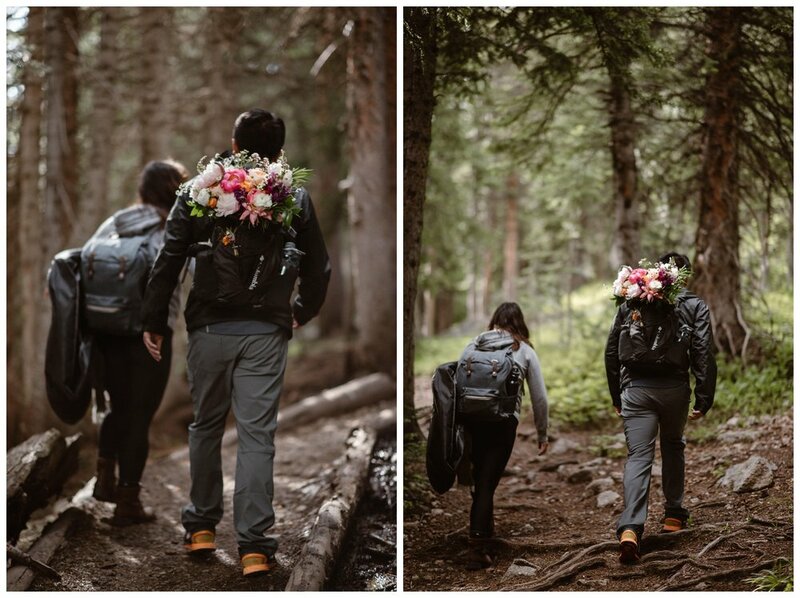 I do a lot of sunrise hikes but sunset elopement hikes are fun as well! You get to really see the trail as you hike up and when you arrive at the top, you’re treated to a dramatic reveal. On the trip down, you can see only where the light of your headlamp hits and you have to rely on the GPS map to stay on the trail. 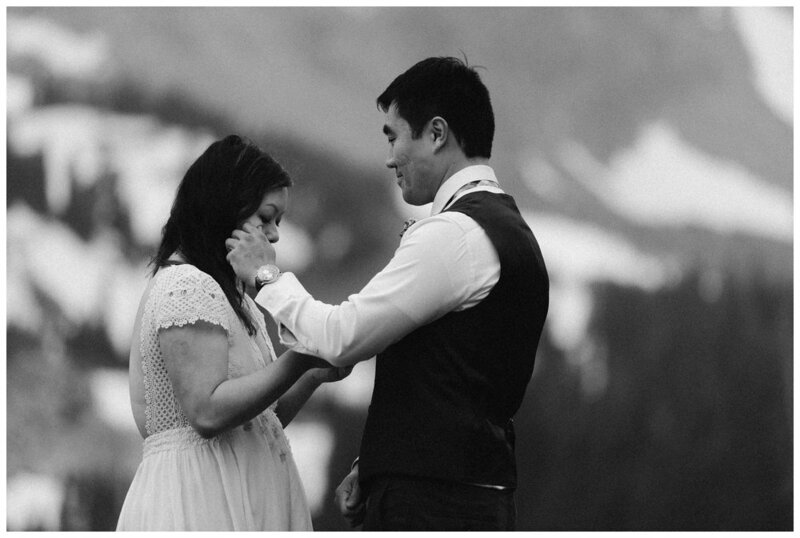 For Leslie and Jinson’s elopement, we hiked down in the dark. We could see our breath with our headlamps on and the fog made it a little bit spooky. We could see only a few stars poking out of the clouds as they rolled around us. At times, we were above the clouds, then below them, then inside them. The weather made the entire day ethereal and unreal feeling. I felt a real connection with Leslie and Jinson. On the entire hike up and back, we never ran out of things to talk about. 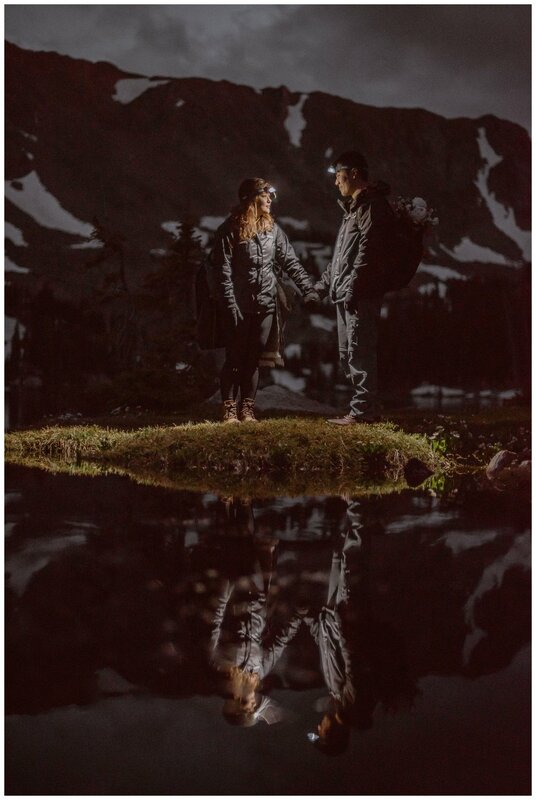 They came to Colorado for a whole week to adventure together and I hope their high alpine lake elopement was the perfect cap to that week.